So where do I deploy my firewall now? I was in a management meeting this morning, and we were talking about how a number of clients are asking Ping Identity to do more and more of the management surrounding their federation initiatives and the entire notion that 'security is going cross-company, and what does that really mean' struck me in a way it never had before. The fact is, as enterprises outsource everything possible that's not core or strategic, they're going to need ways to control, manage and secure them. That's where identity and the notions of identity federation come in, and I'm not talking just single sign-on, I'm talking 'internet-scale security'. In a sense, the entire notion of a "firewall" as defining what's protected from the 'outside' is simply outmoded. There is no 'them' and 'us'. There is only the difference in how you define and control 'us'. Companies need ways to maintain security, but they are drawing the lines around what they need to protect all over the internet. The NEW security company will be the one that helps them do that. All in one must yield to the distributed many POST: Decentralization and "Good Enough" Security, By Gunnar Peterson Great post. Centralized security in a federated world: I love it! That, in a nutshell is why the all-in-one Leviathan must yield to the distributed SysAdmin force. So its not so much that firewalls are dead or useless, but they do not deal with most threats, and in general do not represent the best investment for your security dollars. This idea is the premise of my own book on digital identity: the old centralized models that require everything behind a firewall no longer work and good identity infrastructure is crucial to resolving that dilemma. I’m writing specifically about idenity in the computer-system sense, but there are close parallels to the global world as well. Note that if you’ve read my book you’ll understand that this is a far cry from a call to implant RFID chips in everything that moves. BTW, Phil's book is excellent, and I recommend you buy a copy. I will blog a review shortly. Disappearing perimeter and new applications - we're screwed This post and resulting discussion from Gunnar Peterson provide a lot of food for thought. He uses a decentralization vs. centralization metaphor to make the point that we are inextricably moving toward distributed data. SOA and web services guarantee that. That means the traditional, centralize and apply draconian policies of many security practitioners are no longer valid. Oh boy. If you aren't following me, maybe this quote from the post will help: "The perimeter in an SOA is the document, not the network. The security model is defined by the security constructs in the document, not the network firewall." That kind of screws everything up, no? Gunner goes into a bit more detail in a follow-up post (here) - but understanding the concept is critical. This is the case for why we need to separate out infrastructure security and data/information security. Right here. Read it and understand it. If your security model does not mirror where the business and technology is going then it's broken. Simple as that. The time for pretending ivory tower security with flaming firewalls on visio drawings and thousands of open ports and exceptions is security is pretty much over. Your business is a not a castle behind a moat, it is a node in the midst of many to many relationships. Don't be afraid of it, design for this reality. > errand. Security is designing systems that can tolerate imperfect software. Exactly. On "Curb Your Enthusiasm" this happened recently. Larry David was frantically looking for a DVD case, but could not find it. LD: "I don't know what happened. I have a system. I put the DVD in the player, and I put the case on top of the player. But now it is gone." Friend: "That's not a system. A system is - you buy a bunch of empty DVD cases and put them next to the player." How do we get high assurance in commercial gear? b) If we cannot trust, how can we safely use, security gear of unknown quality? Note the difference in the two characterizations above: how we phrase the question may be important. And of course this among the biggest challenges we have in distributed systems security today. Information warfare, aka 'infowar', is essentially a struggle of intelligence over force, of signs over weapons, of mind over body. Notorious for its many definitions, the meaning of infowar shifts with escalating phases of violence. In its most basic and material form, infowar is an adjunct of conventional war, in which command and control of the battlefield is augmented by computers, communications, and intelligence. At the next remove, infowar is a supplement of military violence, in which information technologies are used to further the defeat of a foreign opponent and the support of a domestic population. In its purest, most immaterial form, infowar is warring without war, an epistemic battle for reality in which opinions, beliefs, and decisions are created and destroyed by a contest of networked information and communication systems. Unlike other threats in this matrix, an act of infowar can undermine the very notion of what constitutes a security threat through manipulation and reconstruction of the mediated projections of identity labels at the heart of so many contemporary conflicts. Furthermore, if the international system or state and other political group interests may be regarded as social constructions, then enemies can also be seen to, in part, create each other through mediated projections of danger, fear and even conflict itself. Infowar has a high "threat level" for network actors. 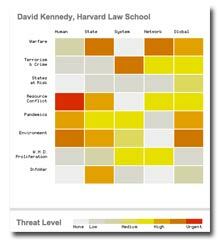 Medium-High "threat level" for human and state actors, and Medium "threat level" for global and system actors. InfoWar targets networks of information, and states may respond by limiting the capacity and freedom of all networks. Linked to cyberterrorism, information warfare carried out against networks can allow assailants to access classified military information and exploit the connections within a network to facilitate a destructive agenda. Censorship by individual states, in an effort to curb this type of information-network exploitation, can hurt the development of beneficial networks and the processes dependent upon proper function of transnational networks. Rankings aside, What is interesting about this approach is it cross references individual threats and actors. Next month in IEEE Security & Privacy, we will have an article on Misuse Case modeling which may be used as an artifact in this area. WS-GameOver: 72% of ESBs using weak web services security? Don Smith points out that the Message is the King and the contract is the queen. It would appear that 28% of organizations take some measures to protect their king. If your opponent is any good at chess this is WS-GameOver. Whatever happened to give 'em enough eyes? This past OWASP App Sec conference was the second in a row where folsk from Microsoft gave an overview about what they are doing wrt software security, and the response from the open source folks was both times more or less "hey we aren't as big as Microsoft, how do you expect us to do all this stuff?" I think this response is pretty weak, after all, open source systems have over the years certainly given Microsoft a run for its money in reliability, scalability and security. Now that Microsoft has turned its own flywheel and by all appearances made some radical moves forward, shouldn't the open source people do the same? I have several friends who write security-focused open source software that is in wide use, and a common complaint of theirs is that it is hard to get people interested in contributing to security projects. Perhaps security is not as interesting to people as other things. Microsoft is a company we love to hate. In particular, the security of Microsoft products has been the target of fierce criticism. However, in the last few years, Microsoft has made a concerted effort to improve the security of their products. The Windows Security Push was launched in 2002 in the run up to the release of Windows Server 2003. At that time, the seeds of the Security Development Lifecycle (SDL) were sown. 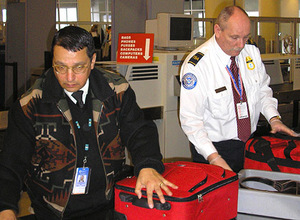 This process has since been refined by many more security pushes. There is a lively debate on Johan's blog entry about all of this. The net result at the conference was that the open source proponents deemed that the things the Microsoft SDL proposes like Threat Modeling and fuzzing are too hard and time consuming for open source developers. I am sure that there are line managers at software vendors like Microsoft who would say the same thing, but there seems to be near universal rejection of this from open source. Deming: "It is not necessary to change. Survival is not mandatory." The simple fact is that the threat environment that Microsoft software faces in the field are the same threats that open source software does. The only question is: how do you engineer your software to be resilient? Last week Michael Howard made a number of interesting points in his presentation, "How the SDL Improved Windows Vista". He discussed findings bugs as early as possible being the best bang for the security buck. He also notes that Microsoft has a number of central analysis team including a central fuzzing team for fuzzing file formats, network protocols, etc. Regarding threat analysis, the trick I have used in the field and is consistent with Microsoft's findings is to avoid having people create attack trees on their own and instead use threat model patterns that they can plug in. He goes on to make the point that because security is human vs human you can never be done. It would seem that some folks in open source would like to say "hey we were better than Microsoft at security in 1999, so we are still better." Microsoft has executed an OODA loop or two since then, here is hoping that open source executes one soon. The last part of the talk concerned how these security improvements manifest themselves in Vista. X64 systems can leverage PAtchGuard which only loads signed code into the kernel. This sounds very similar to a test that Brian Snow referred to where NSA ran test by enforcing digital signature checks on all calls to critical kernel modules. Using a Solaris system this resulted in only single digit percentage performance impacts. That is a nice defense. Where is the uptake of this in open source or Unix in general for that matter? IE7 runs as a low integrity process, Microsoft said they are working with Firefox to get Firefox to run as a low integrity process as well. This is designed to limit damage to other system components that run as medium integrity so an attacker should not be able to write up to those medium integrity processes. Again, something that Firefox sorely needs. Granted they needed the constructs that Vista provides to do this, so they are not necessarily behind in this case. So we have seen that Microsoft has taken steps to protect its users, we have seen some uptake in open source and of course you are always free to take matters into your own hands with open source, but we have not seen the groundswell of defense in depth mechanisms coming out of Redmond. Where does this leave commercial Unix vendors like Sun, IBM, and Apple? One thing I would say to them is, if they can see past religion, they have a great model to begin their security journey. Counterpane says it is extending its service to data security (h/t Mike Rothman) including Oracle, SAP, and SQL Server (you know the places where the assets that run your company live). I remember asking someone from there 4 or 5 years ago why they were not dealing with the app layer. Hey you never know maybe they will drive to the next logical conclusion WS-Anasazi, 'cause you know web services are data too. You would sure think with all the big acquisitions in this space that Counterpane has room to innovate and set itself apart. So we're putting money at risk. With ecommerce were putting large money at risk, but if Coca-Cola lost its secret formula today, we'd be out Coca-Cola. It's not the end of the world, its just Coca-Cola, for crying out loud. And on a given day taste tests can't tell 'em apart anyway. With remote surgery, with invasive medicine, we're putting people at risk. The game is changing. And with Internet voting we're putting the very fabric of the country at risk...because of this changing threat model and because of what we are putting at risk, the game is no longer a game. We have to get extraordinarily serious about what we are doing. Blaine Burnham also said in his talk that "Las Vegas is the monument to the failure of high school mathematics teachers." Hopefully this election won't be the monument to the failure of computer security. There was talk aplenty about metrics at the just completed OWASP App Sec conference. Our friends at Microsoft, led by Mike Howard, repeatedly pointed out there usage of metrics in their SDL. For example, Mike Howard related that MS uses metrics to judge the quality of developers' threat models. We did not get to see examples of the metrics, but I have written to see if/when we could get more details. OWASP has relaunched an App Security metrics project. It is led by Bob Austin from Korelogic. I did not hear his talk (slides should be online rsn), but in talking to Bob it is early days and they are seeking collaborators. Lastly, my panel which was at the end of the conference was focused on the question "What's in your app security toolbox?" and featured : Dave Wichers; Brian Chess from Fortify; Alan Murphy, Product Management Engineer, F5; Danny Allan, Director, Security Research, Watchfire; James Whittaker, Security Engineer, Microsoft, We looked at app security from a number of perspectives (see below), and in order to align efforts across development time, deployment time and run time came to the consensus that a CISO with the prototypical 100 hundred dollars to spend on app security, should invest in education/training, metrics, and process. I taught SOA Security on the training day and as per usual the training class worked through several examples for using security metrics in an SOA. At OWASP App Sec conference, Brian Chess makes a really useful insight on business risk and security risk. His presentation looks at risk from the standpoint of a growing business. What makes this is an useful presentation is that it depicts "how we got here" for many cases we see in the field every day. Brian terms this scenario "why does it feel like we are coming from behind on this." When a company starts its life it wants to take on as much risk as it possibly can, do something hard and prove it in the marketplace. If it is not too risky then a big company may take you out or there may be no market. Over time a successful company's market risk should go down as it gains market share. 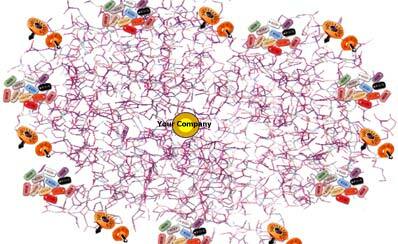 Where is becomes interesting from a security standpoint is that early in the company's lifecycle, the business has high market risk, but little security risk, there is not much in the way of assets to target. But over time as the business gains market share its security risks grow. 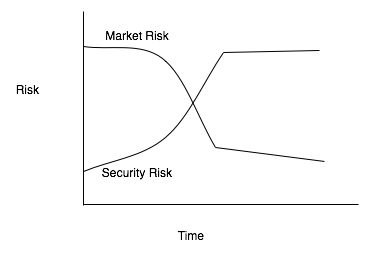 This puts security in a very interesting position where there have to make up for a lot of lost time even if the decisions to delay security made sense at the time, the risk profile have readjusted to the point where more mature businesses who are established in the market and have relatively little residual market risk, at the same time the business takes on more and more security risk. In general this means the code, the config, data and identity architectures all must play catch up to deal with the risk profile over time. How do you this? Build it in over time. Check where Microsoft started on security and where they are now. Toyota started in the US auto market as a joke car that no on took seriously, now they make Lexuses. Successful organizations need to find the right place on the risk curves when their business is ready to beging making Camrys and Lexuses. This means building security into your development process, the questions are how and when. 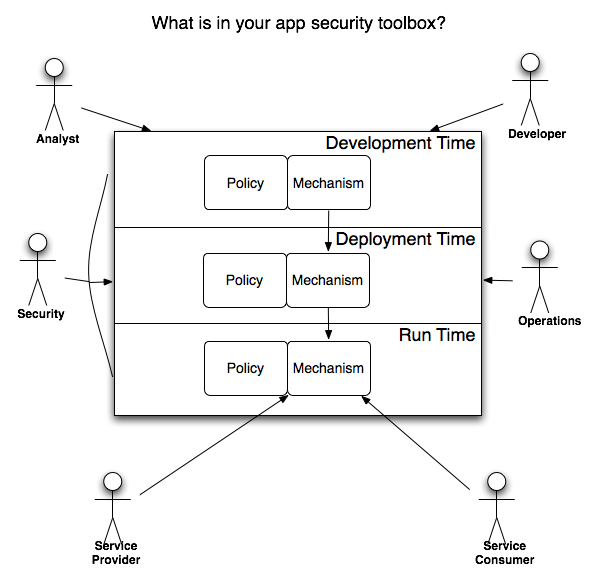 Some thoughts on different approaches to phasing security into your SDLC. Last week, I posted several times on how security needs to align its efforts to be in synch with where business and software architecture is going, namely security architecture needs to be decentralized. Part of this is an increased focus on software and data security. Having smart endpoints buys you a lot from an architecture standpoint, to that end I have been having a lot of fun building on Celtix. Celtix allows you to build ESB-like functionality such as guaranteed delivery and addressing logic into endpoints. Anne Thomas Manes put this into perspective, pointing out that if you have WS-RM at the endpoint, then why do you need to centralize messaging in an ESB? I had a concrete example come up recently. Imagine an app running inside of JBoss container, and you need to communicate with Biztalk. Let's further assume that the messages are valuable and you don't want to lose them. What are your choices. If your ESB was J2EE based instead of .Net you could use JMS, but what if you are .Net on the service provider side and you want to be open standards based? Well, MS supports WS-RM, and JBoss does not yet. One approach is to use Celtix to implement a messaging bridge for communication spanning message channels from JMS to WS-RM over HTTP. This architectural approach shows how smart, standards-based endpoints can overcome integration challenges without resorting to a lowest common denominator approach. Dumb network, smart, decentralized endpoints. We know this scales, this is more or less how DNS works. The Celtix approach avoids the dreaded top down approach and allows to incrementally build SOA from the bottom up. The question is how do you manage all of this distributed runtime? Which makes this pretty interesting. So the SOA folks are out in front of the security people in thinking through distributed runtimes and policy management, but this is where security architecture needs to evolve towards.